Spring breakers are seen on South Padre Island in this 2017 file photo. 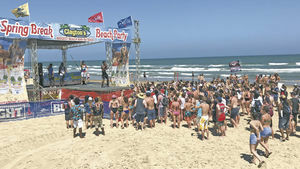 SOUTH PADRE ISLAND — The best place to enjoy wild parties and awesome beach bars for Spring Break is South Padre Island. In coming weeks, college students are expected to drive or fly down by the masses from college towns around the state and nation for music concerts and unforgettable all-day parties under the blazing sun. And local leaders plan to have multiple law enforcement agencies on deck to help keep the peace. She said to ensure everyone has fun and is safe on the Island, city leaders felt it was appropriate to beef up on law enforcement and emergency medical services. “We want to do everything we can to make sure everyone stays safe during Spring Break,” Guthrie said. She said about 190 officers will be on the Island during Spring Break. And they will be equipped with body cameras and electronic ticket devices. “We have doubled the number of officers that we hired last year,” Guthrie said. The police department also is using drones to observe large crowds from a distance. Officials said the drones will be flown by licensed team members and will not fly directly over large crowds. The drones and multiple surveillance cameras around the city will be streamed at the Emergency Operations Command Center at City Hall for law enforcement to view and radio officers on the beach for crowd control. South Padre Island Police Lt. Juan Herrera said an easy way to stay safe is by always sticking with a buddy, obeying the law and avoiding underage drinking. Last year police responded to out-of-control house parties, beach brawls and arrested intoxicated Spring Breakers on the beach. “Our code enforcement and police department will be responding to calls for noise violations, litter and illegal parking,” Guthrie added, warning house parties to stay in line. Fines for code violations could run as high as $2,000 for unlawful house parties. She said Spring Breakers will have many good parties to attend at the Island’s local venues. Mayor Dennis Stahl also advised Spring Breakers to take advantage of the many water sports, from fishing, kayaking to surfing. Or try sand castle lessons and horse back riding on the beach for a once-in-a-lifetime experience. “We also have Gravity Park where you can sling shot like a rocket if you want to,” Stahl added.